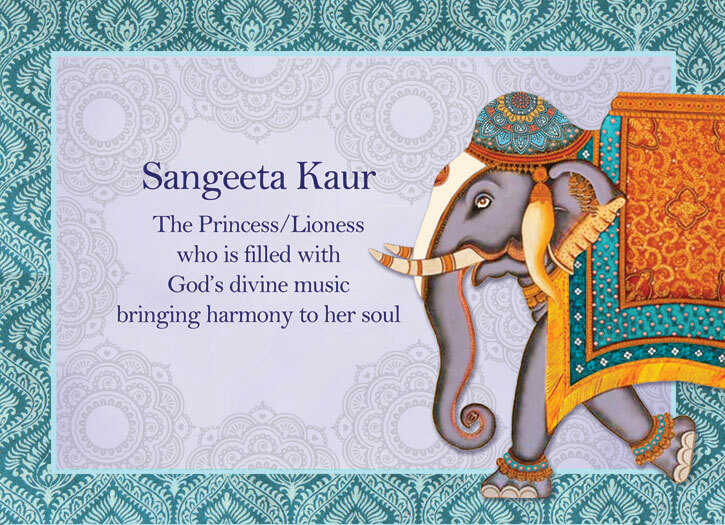 Your spiritual name destiny card serves as a beautiful reminder of the divine sound current (nadh) and meaning of your spiritual name and its power to deliver you to you highest destiny. Use it on your altar as you meditate on your name, on your desk as a name plate, as an uplifting and divine art piece, or as the perfect gift. Each card is 5" x 7" (12.7cm x 17.78cm), fully laminated, and printed to order with a beautiful design, your spiritual name, and its "essence meaning." 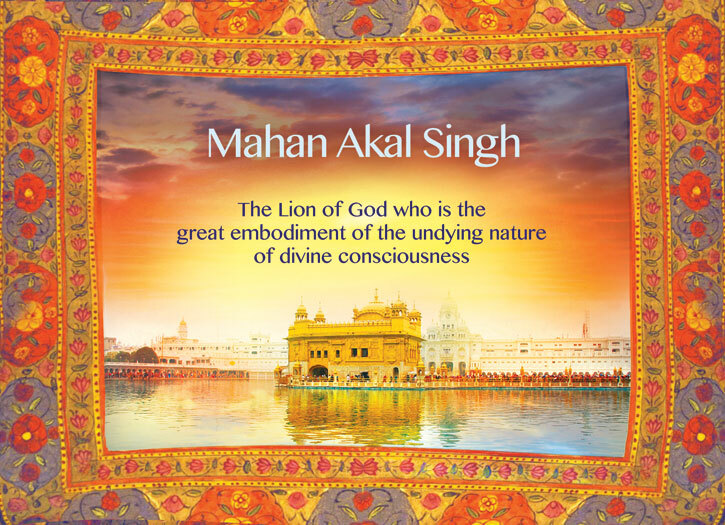 The essence meaning is a short translation of the meaning of your spiritual name. The cost of each card is 20,00 $USD with Free Shipping. If you are an IKYTA member, click here to sign in for your 5,00 $USD discount. 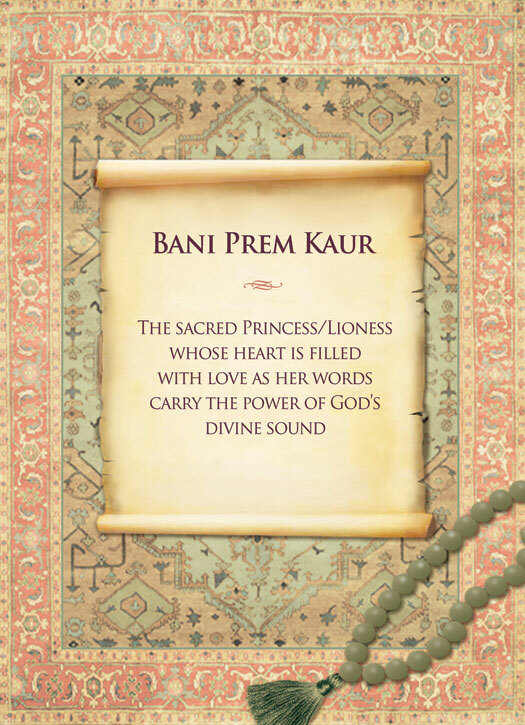 Destiny Cards can be ordered for people who have requested a spiritual name through the 3HO Spiritual Names Office, or have already received a spiritual name from Yogi Bhajan or Nirinjan Kaur. If you have NOT already requested a spiritual name, CLICK HERE to request one. This is the name you entered on the Spiritual Name Request Form. 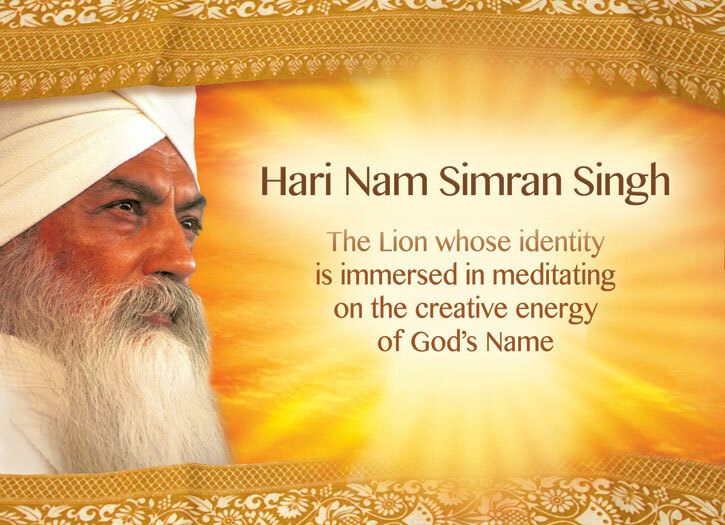 Check here if Yogi Bhajan did NOT give you a meaning with your name. Check here if you do NOT have the letter, or if you do not remember it. Please note that we have been in the process of revising some of the essence meanings for the purpose of clarity and accuracy. Therefore, the essence meaning of your name on your spiritual name destiny card may not match the wording you had received in your name letter (but does carry the same meaning). Check here if you would like the essence meaning on your Spiritual Name Destiny Card to match the wording you had received in your name letter. 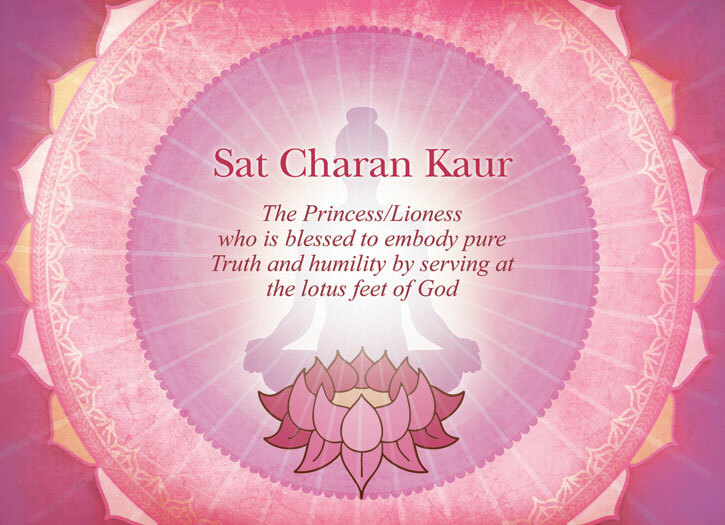 The essence meaning of your spiritual name will be printed on your destiny card in the language selected above. Note: We will be adding other language options in the future. Click the images below to view a larger version and description of each card. 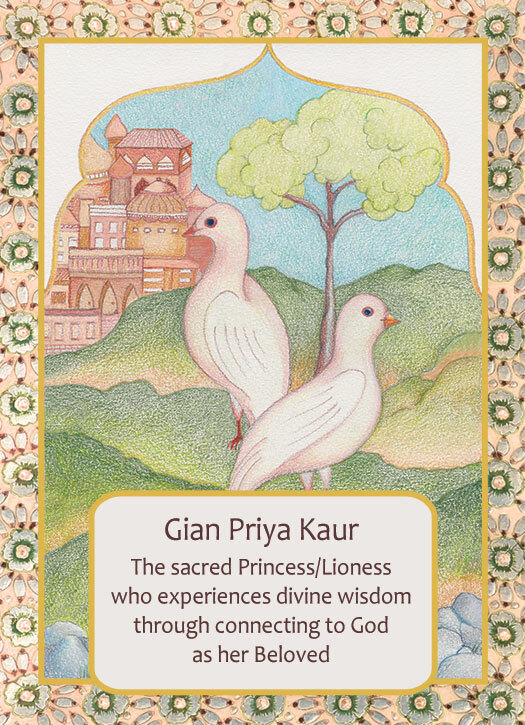 You can order multiple cards for this spiritual name by selecting more than one card. The elephant represents good fortune, nobility, confidence, commitment and incredible strength to overcome all obstacles and barriers in life. Possessing a profound compassionate and patient nature, it shows that by supporting and loving one another, our own ability to thrive is deeply enhanced. It helps us to remember the beautiful memories long forgotten, and the reasons for living. An elephant has big dreams to share – expanding the mind to explore new avenues and possibilities. As a spiritual being, it carries messages of transformation signifying the emergence of our highest selves. Guru Ram Das is loved and revered as an embodiment of compassion, humility, integrity and service. 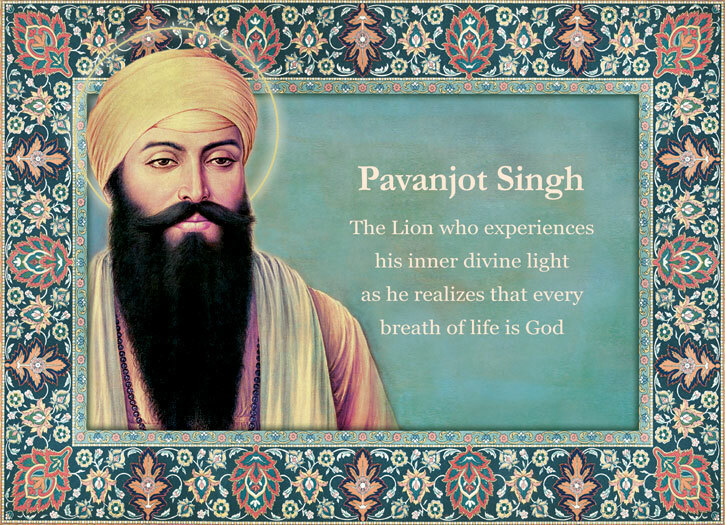 A master of the neutral mind, he was known for his extraordinary gift of healing. Recognized as the “Lord of Miracles,” when calling on him, many find that their prayers are answered. With its roots in the mud of the world, the magnificent lotus flower rises above the water's surface and awakens and blossoms in the loving rays of the warm sun. A universal symbol of enlightenment, the lotus is the very image of a spiritual life. It mirrors the opened crown chakra or energy center through which we experience Oneness. 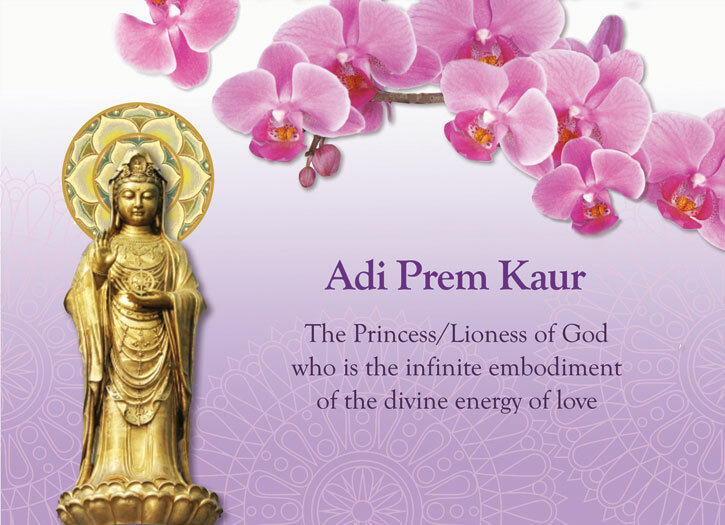 Kwan Yin is the embodiment of the Great Mother goddess. In her hands she holds a vessel filled with the nectar of healing and kindness. 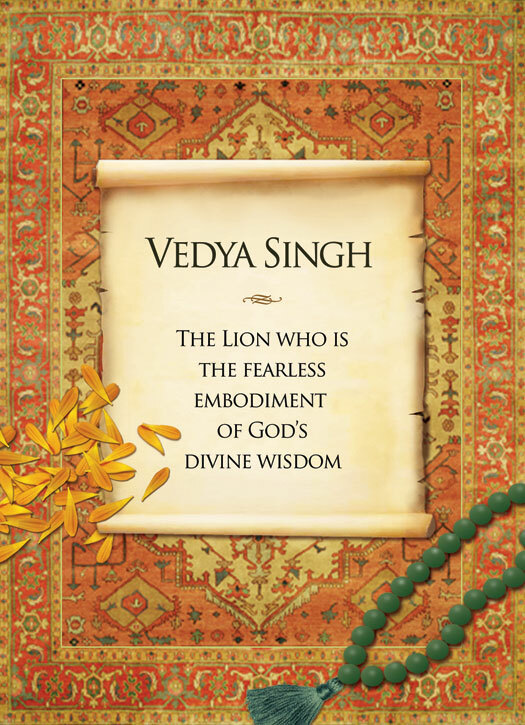 Encompassing all religions and spiritual paths, her compassion illuminates the whole world. Around her the wheel of mantra revolves infinitely. The ancient Chinese revered the orchids surrounding her as "Lan Hua," the epitome of human perfection. Within her nobility, strength and grace lies a heart filled with the purest love. The Golden Temple is surrounded by a nectarial tank of water, which has been infused with a powerful vibration of healing energy. Built half of white marble and half of gold, its four doors are open in all four directions. Symbolizing universality and the union of opposites – the sun and moon, male and female – it embodies the elevated frequency and energy of the Aquarian Age, the age of conscious connection, truth, and unity. Yogi Bhajan's life, light and journey was to uplift humanity by sharing his timeless teachings with all. He worked to create unity among people of every faith and belief. Although he left his physical body in 2004, his presence, spirit, and legacy continue to touch the lives of all those who knew him and all those who learn of his teachings. Everyone requires an "ISHT" in order to live as a human being. Your Isht is the place where you bow your head and surrender your ego to something higher than yourself. The prayer carpet, scattered marigold petals and mala (rosary) signify devotion, reverence and remembrance of our True Identity as spiritual beings. Everyone requires an "ISHT" in order to live as a human being. Your Isht is the place where you bow your head and surrender your ego to something higher than yourself. The prayer carpet and mala (rosary) signify devotion, reverence and remembrance of our True Identity as spiritual beings. There is a reason doves come in pairs: they mate for life, and so stand for love and faithfulness. But doves have a deeper meaning as well. Pure and unbound by the earth, doves are a symbol of the living spirit... the luminous presence within all things. When we experience this spirit within everything in each moment, then we connect to our shunia, the inner source of the deep, infinite peace, that passes all understanding. In this way, doves have become a well-known peace symbol.